On September 13th, 1814, lawyer and poet Francis Scott Key was negotiating the release of American prisoners aboard a British ship when he became a prisoner, himself. Held through the night, he watched the relentless bombardment of Baltimore by land and sea, and finally, a resilient American flag flying above Fort McHenry the next morning. Inspired, Key wrote a poem that would change our culture forever. Here are 10 surprising facts about our national anthem, and the flag that inspired it. 1. The melody is set to an old English drinking tune. Ironically, the melody of “The Star-Spangled Banner” is English—not American. The tune comes from the old drinking song, “To Anacreon in Heav’n,” the official ditty of an 18th century London men’s social club called the Anacreontic Society. 2. And before it became our anthem, it was an American drinking tune, too. Back in the days before national media, one of the best ways for a politico to reach the common man was through catchy tunes sung at bars and parties. So while second president John Adams was campaigning for reelection against Thomas Jefferson in 1800, he borrowed the old Anacreon tune for a propaganda poem called “Adams and Liberty.” The poem warned against mercantilism and foreign involvement, spearing Jefferson’s notorious pro-French sympathies. Jefferson’s camp countered with “Jefferson and Liberty,” a 15-verse defense or free speech and religion sung to an Irish jig. Jefferson won the election, but Adams’ song may have single-handedly turned a British tune into an American earworm. 3. The lyrics come from a poem. Francis Scott Key penned the words of “The Star-Spangled Banner” in Baltimore on September 14, 1814. But these lyrics were originally intended as a poem called “Defense of Fort McHenry,” written after witnessing an American flag raised triumphantly above a Baltimore stronghold the morning after a 27-hour British bombardment (as the poem says, “our flag was still there.”) Key’s brother-in-law first made the connection between the poem’s words and the Anacreon tune a few days later, printing it with sheet music in The Baltimore Patriot on September 20th. 4. The original sheet music contains an infamous spelling mistake. There are only about a dozen copies left of the original 1814 sheet music imprint of Key’s “The Star-Spangled Banner.” The original edition can be easily identified by the misprint “A Pariotic Song” in its subtitle. 5. There is more than one verse. 6. The real Star-Spangled Banner has a sibling. In 1813 a woman named Mary Pickersgill, a Baltimore flag maker, was asked to make two flags for Fort McHenry. One of these, the 30-foot by 42-foot army flag would later become the Star-Spangled Banner. Its sibling, a smaller storm flag, measured 17 x 25 feet and was designed to withstand even the toughest of weather, saving wear and tear on the larger flag. 7. The song sounds much different now than it did 200 years ago. Francis Scott Key himself wouldn’t recognize today’s version of the national anthem. The song was originally intended for a group of people to sing together. Today “The Star-Spangled Banner” has become a complete soloist affair, and the pace and general tempo is often much slower. 8. Today, the song is difficult for even a trained singer. Many superstar singers struggle to sing our national anthem: From Christina Aguilera forgetting the words at Super Bowl XLV to Michael Bolton writing the lyrics on his hand, the song doesn’t come easy. Kenneth Slowik, director of the Smithsonian Chamber Music Society, says, “It has a lot to do with the range…Basically, the notes are very high.” Particularly throat-straining: singing the highest note of the piece on the “e” at the end of “free.” Don’t believe it? Try it. 9. Our national anthem exists because of a cartoon! America didn’t have a national anthem until 1931—and it could have taken longer if not for a cartoon. 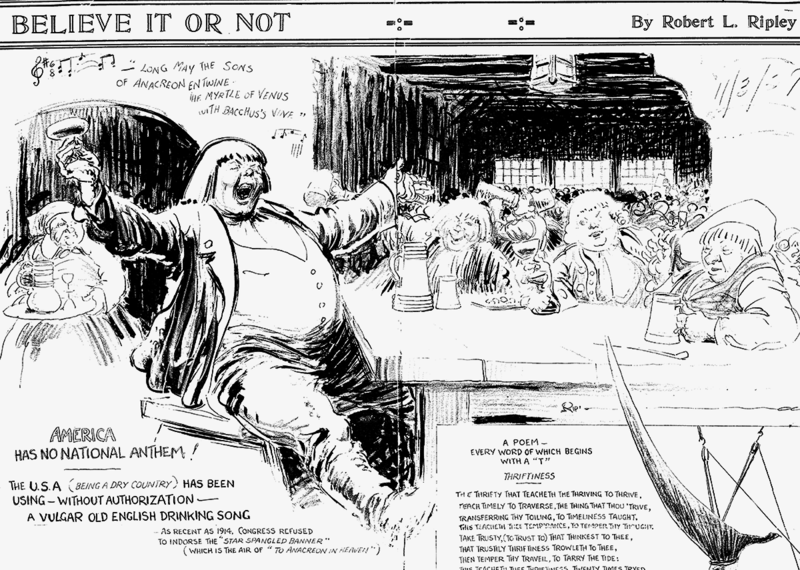 In 1929, Robert Ripley published an item in his syndicated “Ripley’s Believe It or Not!” cartoon pointing out the fact that America did not have a national anthem. After Ripley received many letters of backlash, he told these upset patriots that their efforts would be better spent writing their congressmen. This led to a five-million-signature petition asking Congress for a national anthem. It worked. In 1931, President Herbert Hoover signed a law making “The Star-Spangled Banner” the official national anthem of the United States of America. 10. The actual Star-Spangled Banner was hidden away during WWII. In 1907, the famous flag that flew above Fort McHenry first came to the Smithsonian Museum in the National Mall, and has only left once since Eben Appleton permanently donated it in 1914. After the attack on Pearl Harbor, President Franklin D. Roosevelt felt that the Japanese could possibly attack the National Mall, so from 1942 to 1944 the flag and many other treasures were sent to Shenandoah National Park near Luray, Virginia, for safekeeping. Today, the war-weary flag that inspired our anthem is on permanent exhibition at the Smithsonian National Museum of American History. Why Are There 5,280 Feet in a Mile?